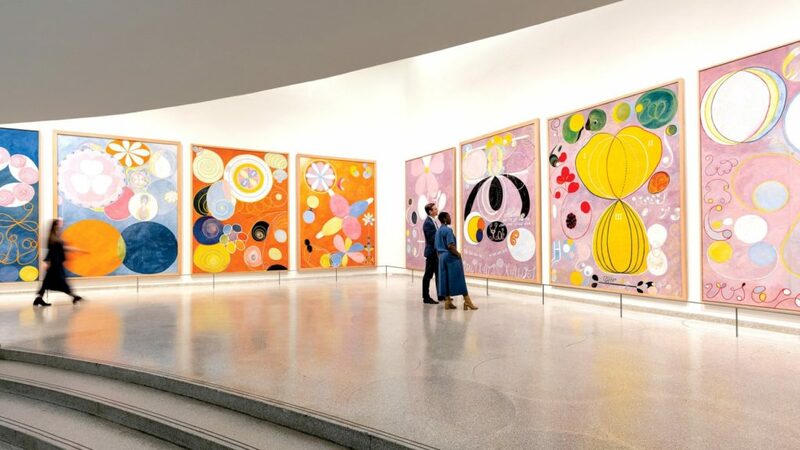 Final Week: Through Tuesday, April 23, 2019 – Hilma af Klint: Paintings for the Future at Solomon R. Guggenheim Museum, 1071 Fifth Avenue, New York, NY. When Hilma af Klint began creating radically abstract paintings in 1906, they were like little that had been seen before: bold, colorful, and untethered from any recognizable references to the physical world. It was years before Vasily Kandinsky, Kazimir Malevich, Piet Mondrian, and others would take similar strides to rid their own artwork of representational content. Yet while many of her better-known contemporaries published manifestos and exhibited widely, af Klint kept her groundbreaking paintings largely private. She rarely exhibited them and, convinced the world was not yet ready to understand her work, stipulated that it not be shown for twenty years following her death. Ultimately, her work was all but unseen until 1986, and only over the subsequent three decades have her paintings and works on paper begun to receive serious attention. This survey of Hilma af Klint’s work has been the first major solo exhibition in the United States devoted to the artist, offering an unprecedented opportunity to experience af Klint’s long-underrecognized artistic achievements. For more: guggenheim.org.